Surrounded by light filled windows, InsurX’s new office maintains the openness of the interior space with high ceilings and exposed timber panelling. 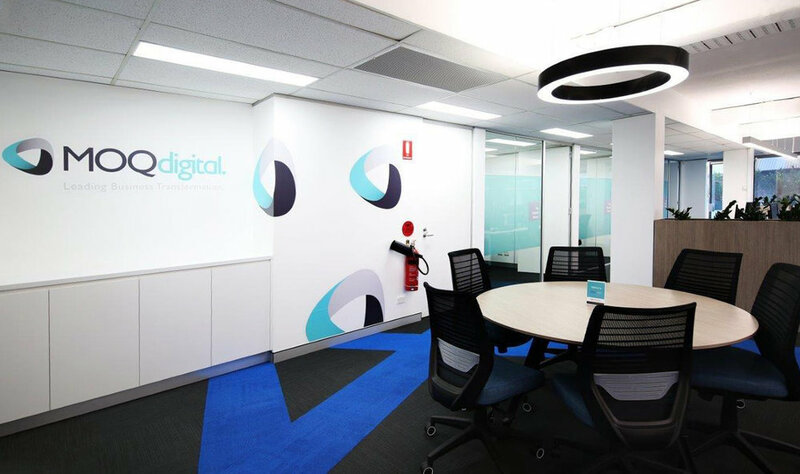 With feature walls displaying motivational quotes throughout for visual impact, Designate Interiors designed an office that harmonizes the internal details and furniture effectively. 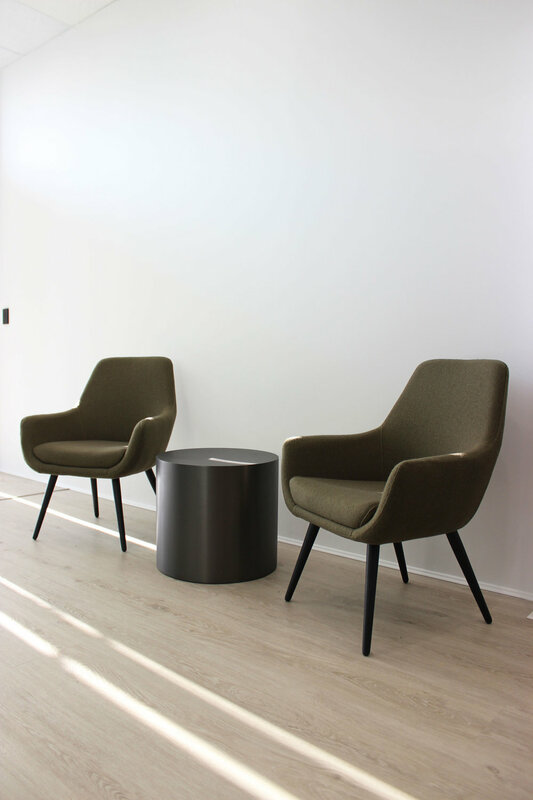 Exuding natural hues of brown and grey, our Cooper chairs and Dart coffee tables welcome visitors as they enter the office. The use of woods creates an inviting feeling of coziness and warmth. Extending the visual focus beyond the entrance, meeting rooms can be seen through the tall glass windows. Using Velo tables and Universal storage in a light timber finish with black legs, surrounded by our Zed Chairs, a formal yet soft atmosphere was crafted. This aesthetic is continued in the boardroom and other meeting rooms, complimented by the same furniture setting. 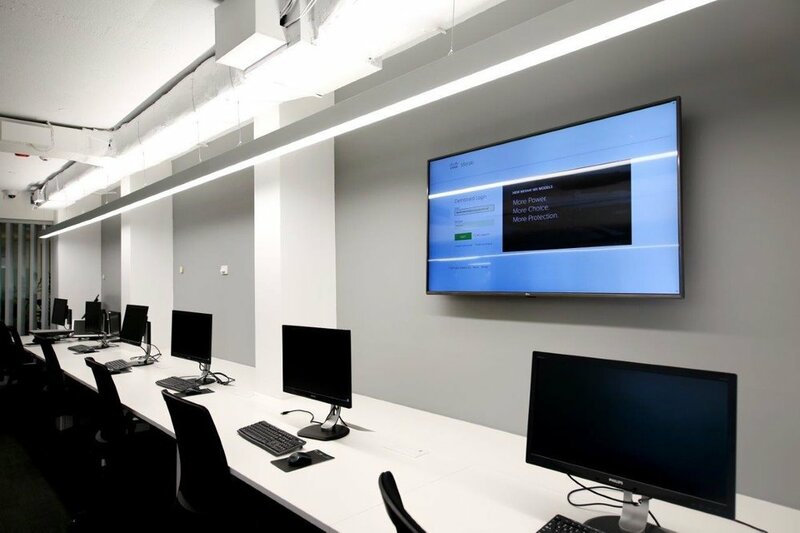 Utlising the generous office space, the area was filled with runs of our Keywork workstations, perfectly paired with Trak screens, planters, Space chairs and black Globe pedestals. Creatively hidden by curved floating walls, our Halo table in a custom semi-circle shape and Space chairs form a collaborative area for employees. 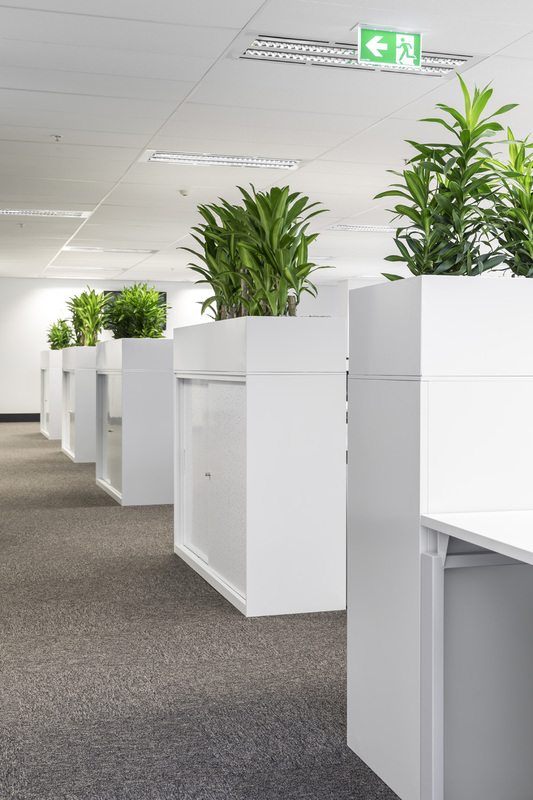 Green plant walls integrated with whiteboards cultivate a natural element with additional texture. 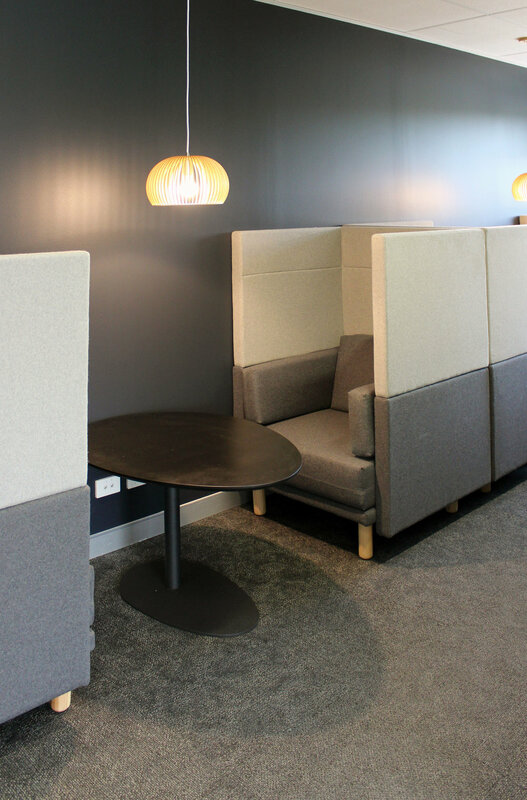 Considering the nuances of the modern workplace, breakout areas have been created for the team to relax. Designate Interiors turned a nook into a haven for our Jive counter table and Zorro stools which form a continuous bench situated in front of another green planted wall. Opposite this sits out Benj high lounges and Dart organic coffee table for more private spaces. Moving into the kitchen and lunch area, our Sofi lounges and Dart organic tables form pods of soft seating. Upholstered in contrasting blue tones, a more playful atmosphere has been created. 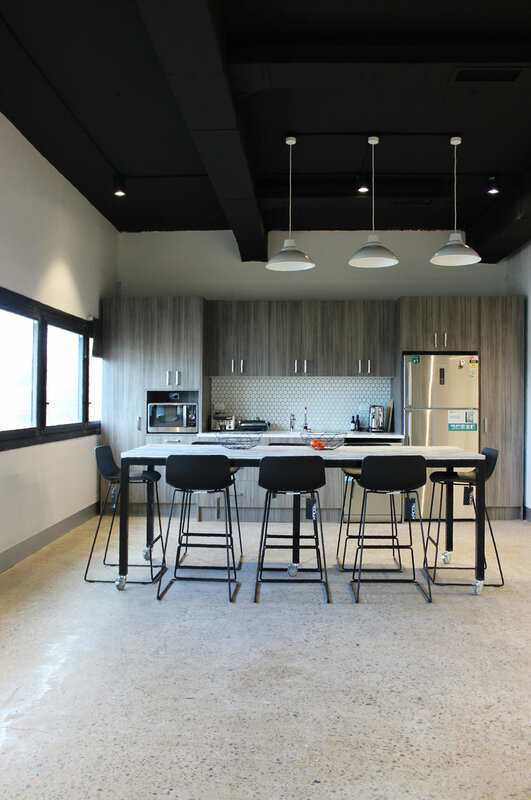 Insurx’s new space considers the different working environments for the modern employee. Providing various settings that focus on connection, collaboration and comfort by the curation of furniture, finishes and aesthetic. 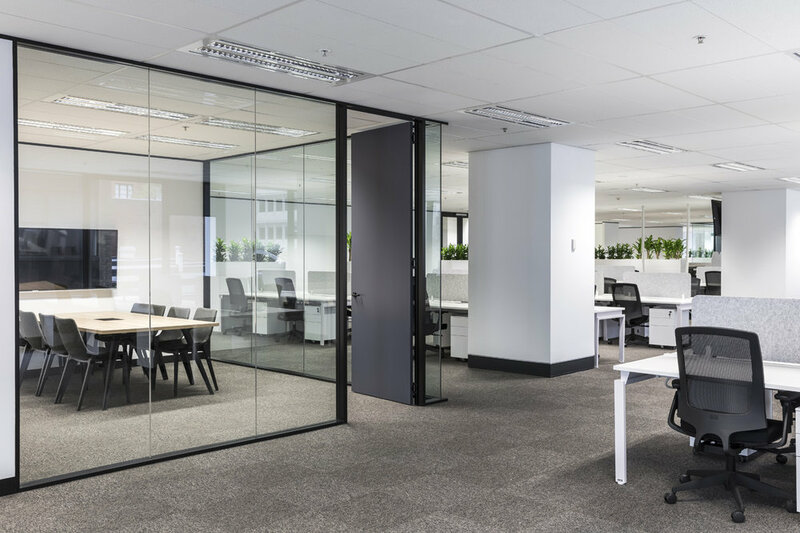 From the large open spaces to intimate executive offices, meeting rooms and breakout areas, Fastways new office exudes style and sophistication through a strong monochromatic palette. The strong contrast between fresh white interiors and black furniture seamlessly transitions from one room to the next for a consistent look and feel. Welcoming visitors, our Jive reception counter is a grand feature in front of the slatted timber wall. Complimenting the space are Tex lounges and Drum coffee tables, creating a simple yet inviting entrance. Mix bench seating and Cooper chairs pair with a Jive coffee table to divide the open plan areas forming a contemporary statement in each gathering space. Enhanced by the large natural light filled windows, hues of brown and grey add warmth and break the monochrome dynamic. 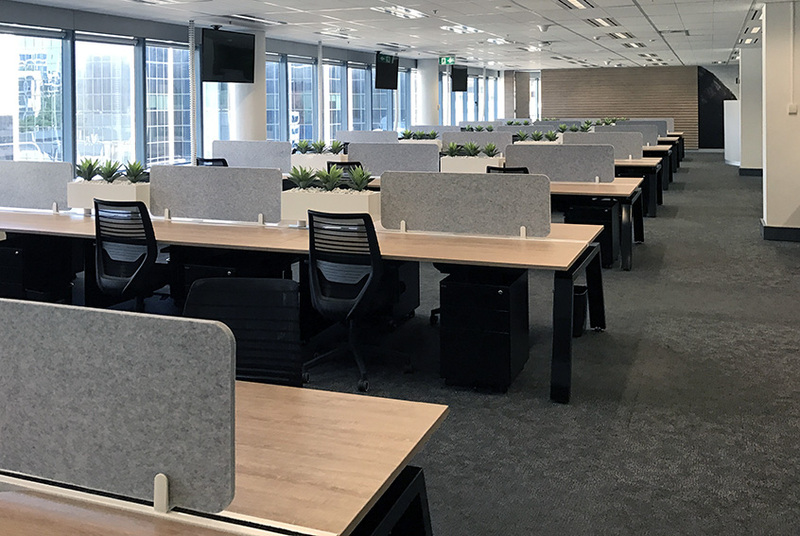 Our Benchwork workstations are used on the lower and upper level with Sonic task chairs, Globe pedestals, Screenwork screens and Logic monitor arms to cultivate working areas suitable to a vast range of needs. Breaking up the area is our Keywork table and Balance ottomans allowing different levels of function and collaboration. Continuing on with the contrasting palette, the executive offices feature Keywork desks with Miro and Zorro chairs. Working symbiotically with the architectural details of the interiors, each office offers a warm and textured backdrop to the main open space. Our Alex chairs and Dart tables were used in meeting rooms to establish more formal areas whilst maintaining a balance of simplicity and modernism through the dark oak finishes combined with natural light. Finally moving into the lunch area, a fresh clean palette in contrast with the rest of the office has been established. 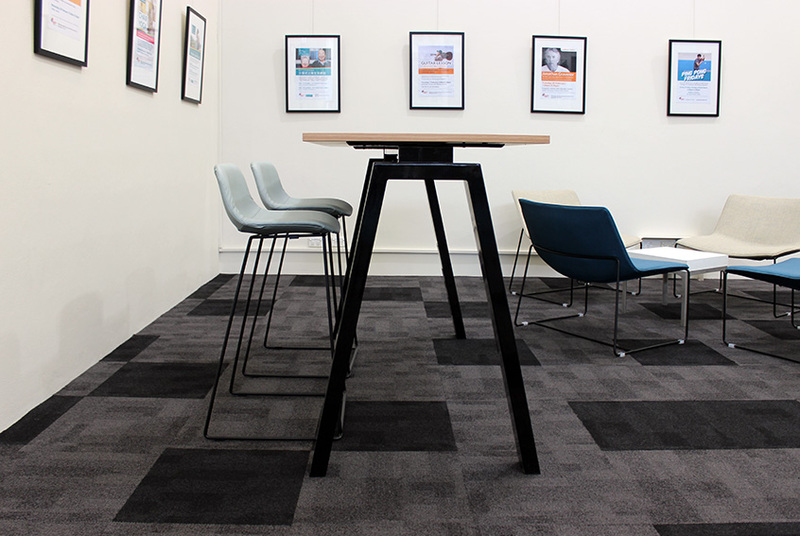 Our Jive counter table and Zorro stools paired with the Halo counter table and Pac stools create a breakout area which emanates a calm and peaceful space for employees to take a break. Different zones were created to establish a variety of functional workspaces including open plan work areas, meeting rooms, breakout rooms and informal meeting spaces. Fastways new office caters to every need of the modern employee. Crafting the perfect entry or waiting area is important as it is an opportunity to make a lasting first impression for visitors. 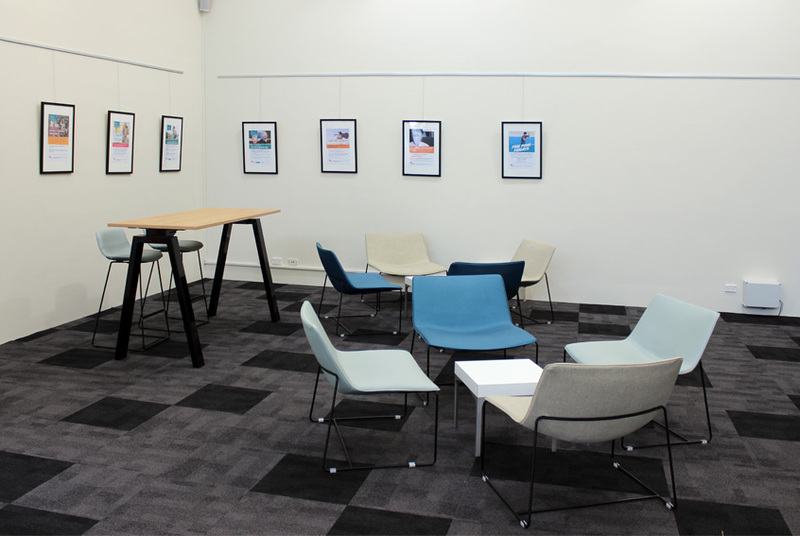 Recently, Georges River Council undertook a project for Kogarah Library, where each space was fitted out in an eclectic and diverse style. 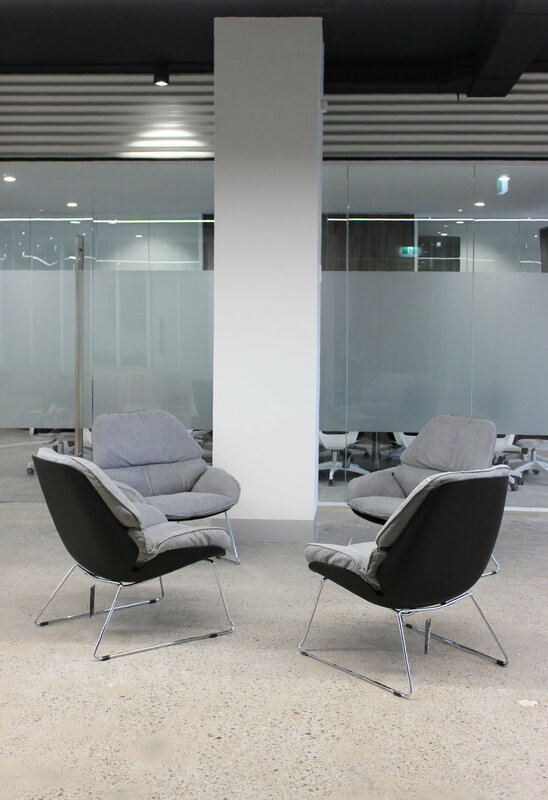 Upon entry to Kogarah library, you are greeted by a large, light filled open space before moving into the main area. 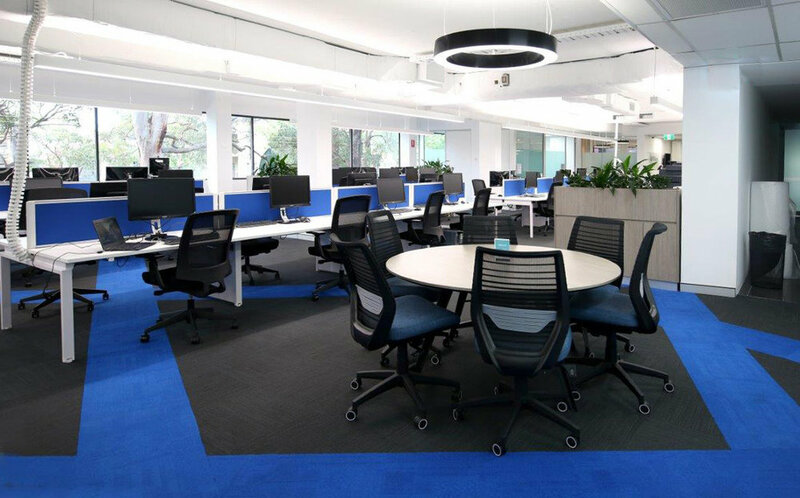 In one section, our Zorro chairs upholstered in two shades of blue fabric are paired with the Halo table, creating simple yet effective working areas. 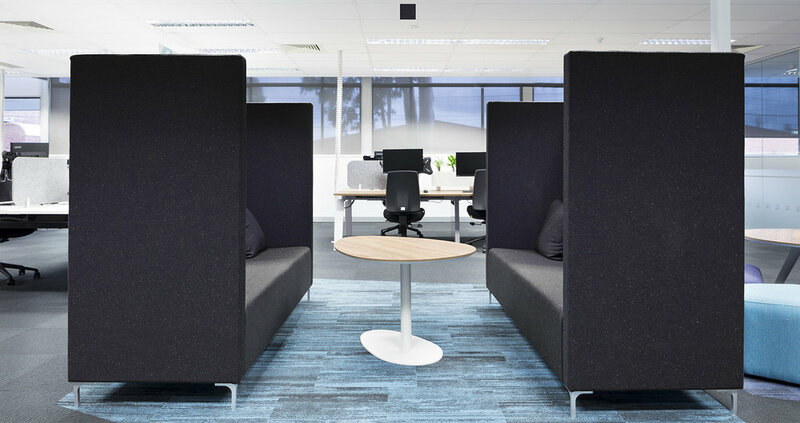 Continuing on with the contrasting blue theme, our Cali chairs group together to form pods of soft seating for a more relaxed or informal meeting area. 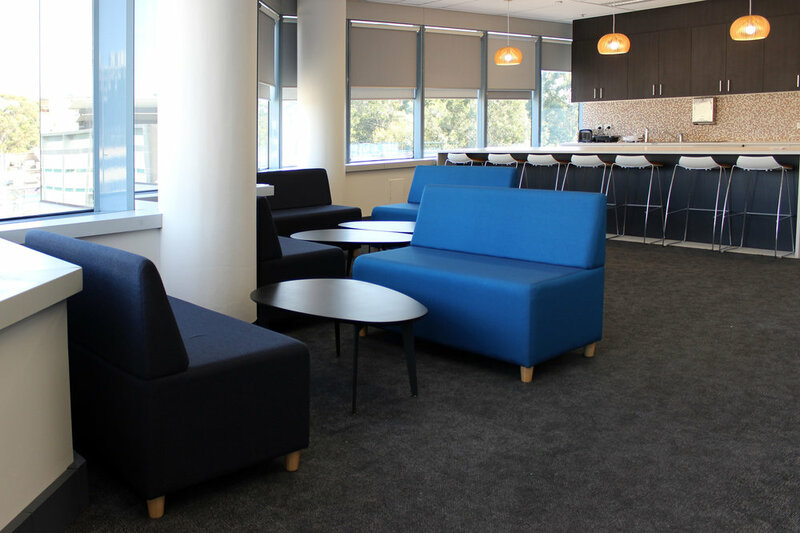 Georges River Council created a workspace with an open-ended environment by adding our Keywork Counter Table with Zorro Stools for individual or focused work. Each section can be modified or rearranged for visitors to create their own space based on their needs or requirements. 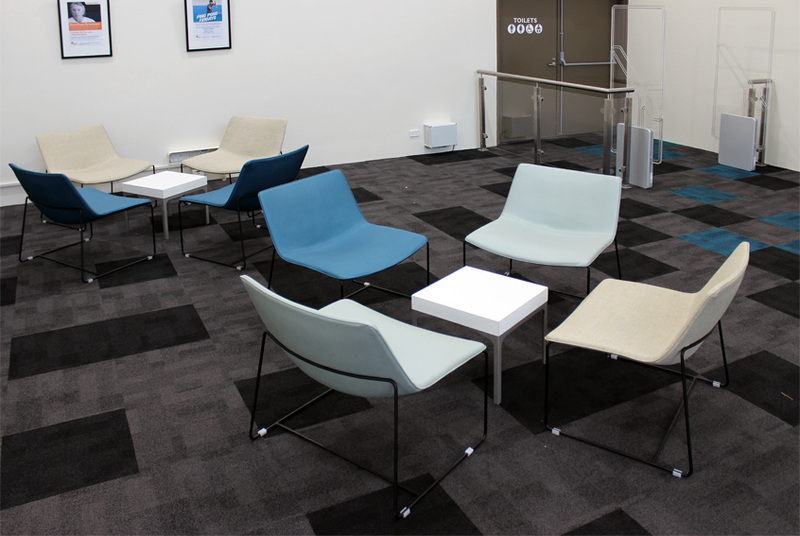 Thoughtful in design, Kogarah Library addresses the nuances of different seating arrangements based on their location. Situated across from the service desks are our Sofi ottomans in a mixture of curved and square shapes to form a continuous line of seating. Upholstered in the same blues as the Zorro and Cali chairs paired with our Byte Side Table, a bold and energetic pattern is created in contrast with the green carpeting. Special consideration for visitors and their range of needs within the library is evident in the variety of settings provided. By allowing freedom and flexibility within the space, one is able to utilise it to its best ability whilst maintaining a level of comfortability. Using an eclectic palette of colours and range of materials, Riverwood Library’s new space features layers of visual interest at every turn. 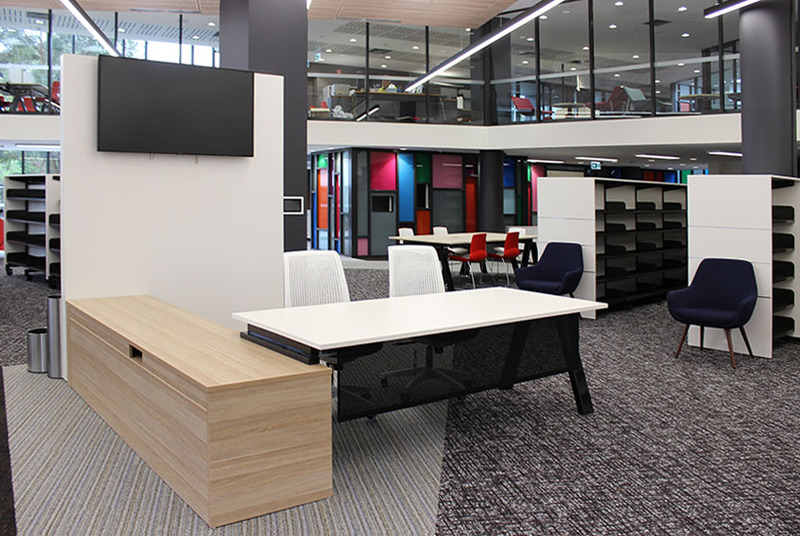 Throughout the libraries open layout, parts of the original structure are interjected with new furniture, lighting and mosaic glass panelling creating a fun, contemporary environment. Cascading along the natural light filled windows, our Gogo and Sofi Ottomans paired with Halo Coffee Tables welcome you as you enter the library. Using our Cooper, Cali and Clip S chairs, a theme of red and blue is incorporated into every room, transitioning from one space to the next effortlessly. In the middle of the library, our Keywork Spine desk and Space chairs are used for visitors seeking help and looking for more information. Using a combination of Natural Oak and White finishes, a bold contrast is made with the geometric carpet design. Our Keywork Tables paired with red Clip S chairs create an energetic burst of collaborative and training areas. 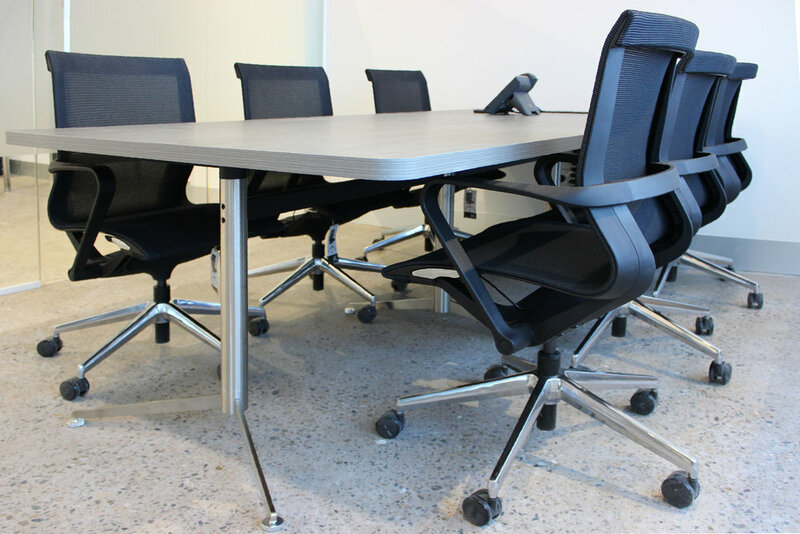 Moving upstairs, the Clip S’ are combined with Flip tables for more intimate meeting rooms. The colour scheme is continued with the Keywork workstations and Trak Screen system, for a cohesive look and feel. 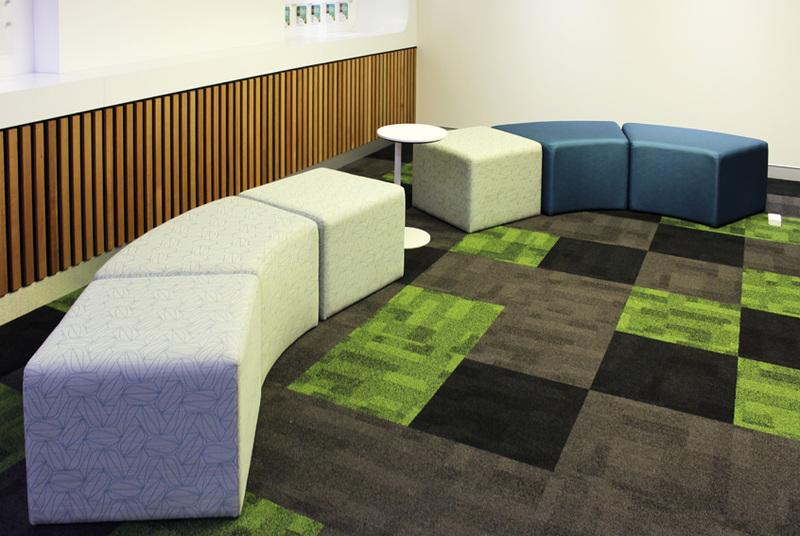 Designed by CK Design, Riverwood Library features eye-catching details and bold colours throughout for visual impact. Bringing in new and innovative ideas to the traditional space a modern aesthetic was achieved. From its large open plan space filled with practical storage to its multiple formal and informal meeting areas, Ashe Morgan's new office has been perfectly designed to respond to the team's every need. Our Benchwork workstations have been combined with the ever popular Space chairs, Screenwork screens and Globe underdesk drawers giving each staff member a secured space for all their small belongings and plenty of storage has been added throughout the entire office with our Globe sliding door cupboards. Tex arm chairs welcome visitors upon entry in a warm oatmeal fabric while meeting rooms furnished with Dart tables, Sax and Alex chairs provide private spaces to seal the deal. Breakout areas throughout the office allow staff and clients to gather for informal meetings and feature our Drum coffee table and Zorro chairs, Uno counter table and Zorro stools, Sofi ottomans and Dart Organic coffee tables. 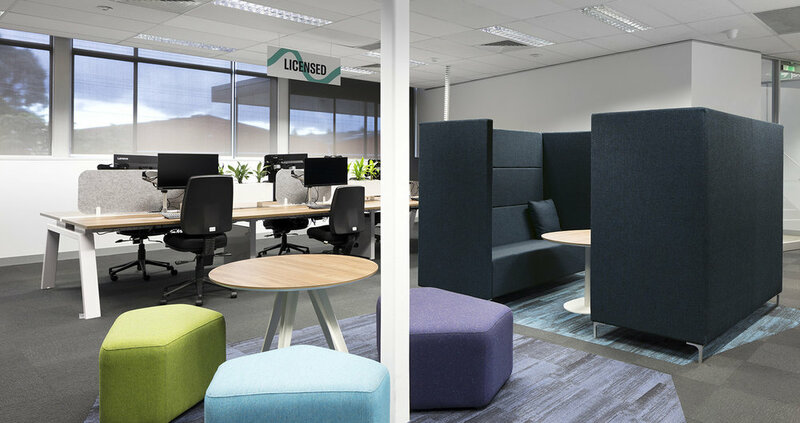 Designed by RBG Services, Ashe Morgan's new space is filled with bright and bubbly colours creating a fun environment for all to work in. CAN Finance Group’s new office features a clean palette of colours filling each room with a modern and cohesive feel. Combining Maison Oak and Black Wenge Ravine finishes, a refreshing scheme is carried throughout. 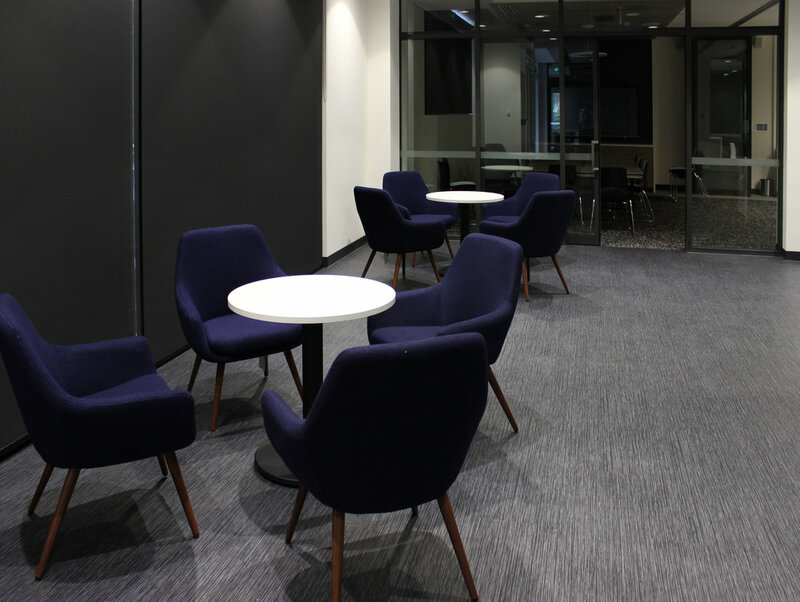 Our Cooper chairs in khaki and black Drum coffee table welcome visitors whilst also providing a breakout area for the staff. 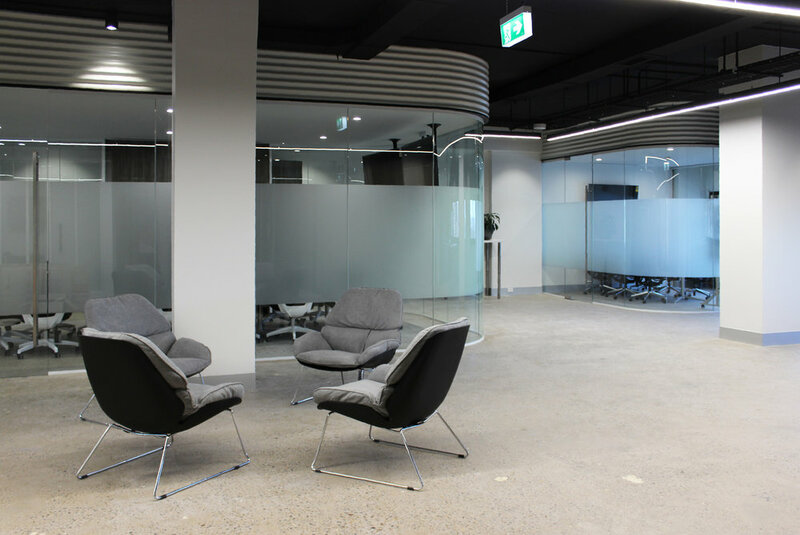 Offering a modern outlook on what a mortgage broker office might look like, our Keywork Spine, Space chairs and Trak screen system create a practical open plan area. 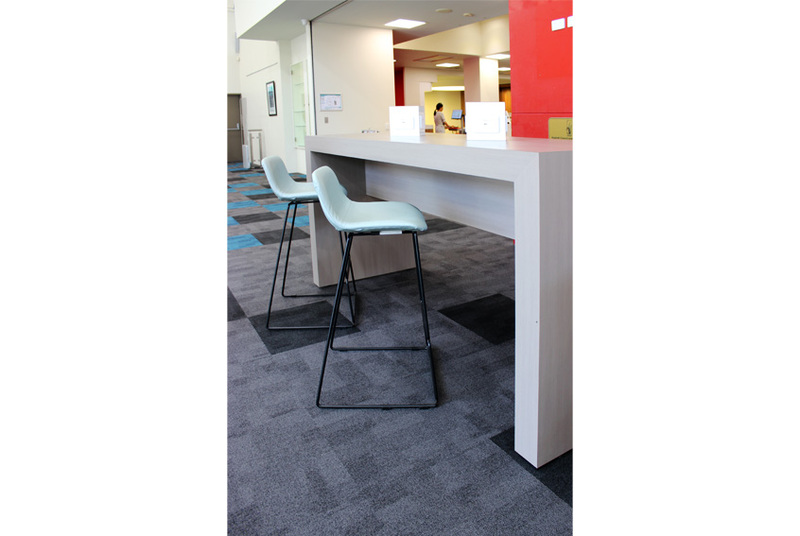 The Jive counter and Zorro stools divide the space allowing different levels of function and collaboration. 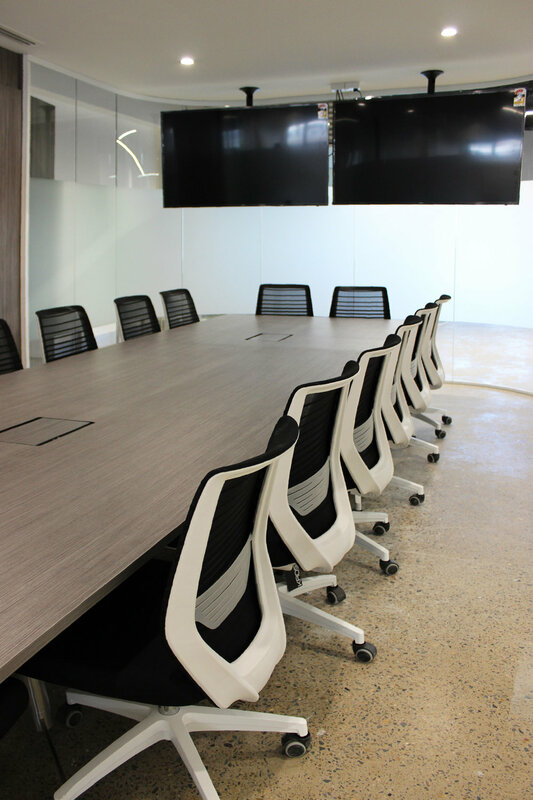 The light filled boardroom is contrasted with dark clean lines through the Dart table, Zed chairs and Universal storage. 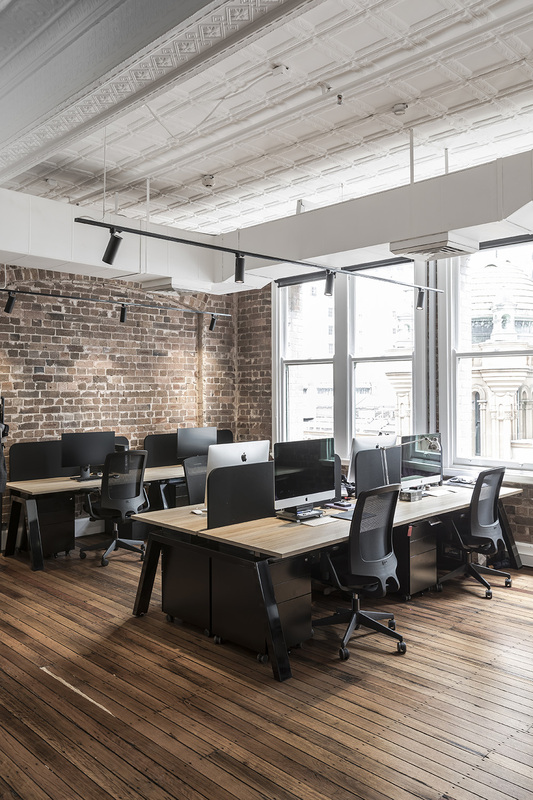 Seeking a space to run their global software headquarters, Reckon required an environment that encapsulated professionalism and innovation. 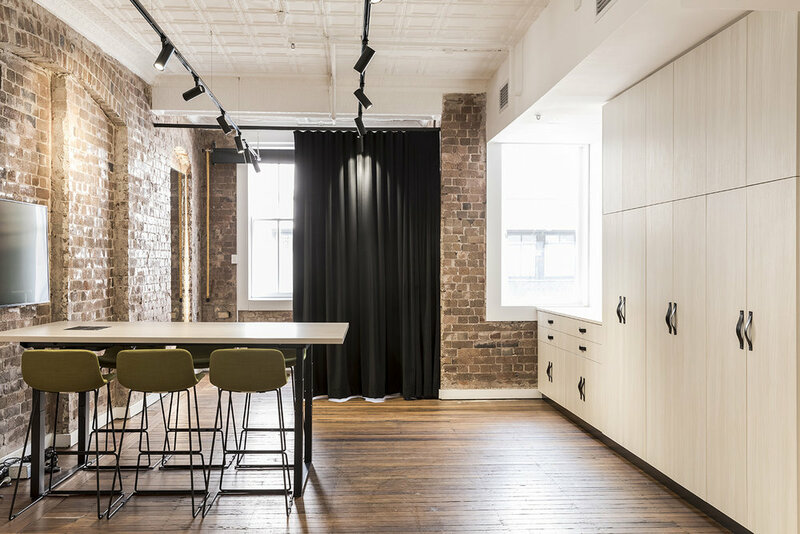 Drawing inspiration from a monochrome palette the designers at Maxam & Co created a workspace that truly possesses all the qualities that a leading edge company requires to succeed. Our Benchwork workstations and desks feature in the executive and open offices, perfectly paired with Miro chairs and surrounded by sliding door units with lush plants. Breakout spaces feature a combination Zorro stools, Uno tables, Sofi ottomans and Scape screens whilst the stunning glass lined meeting and boardrooms showcase a mix of Madi and Zorro chairs teamed with Dart tables to complete the look. 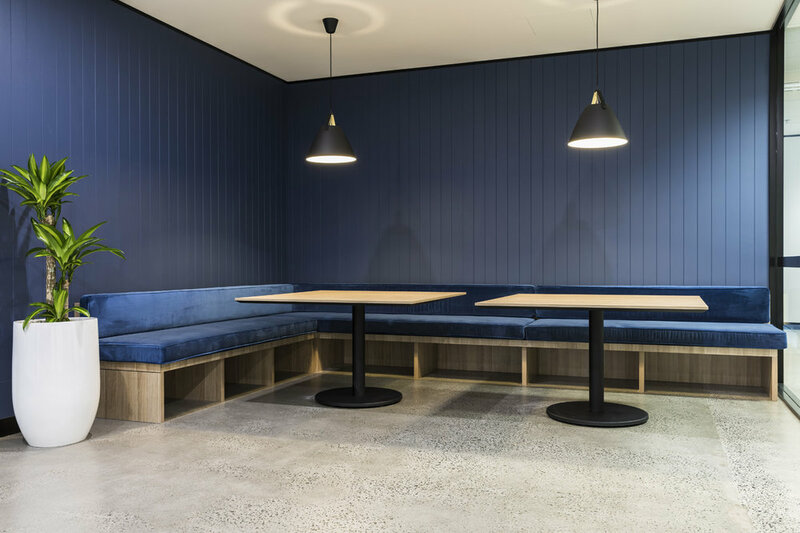 The café area boasts polished concrete floors with striking contrasting blue panelling. Our Halo tables complimenting the space with black bases and natural oak tops. From open working areas, to boardrooms, breakout spaces and executive offices alike – every space has been carefully planned to create a cohesive and supremely functional workspace. 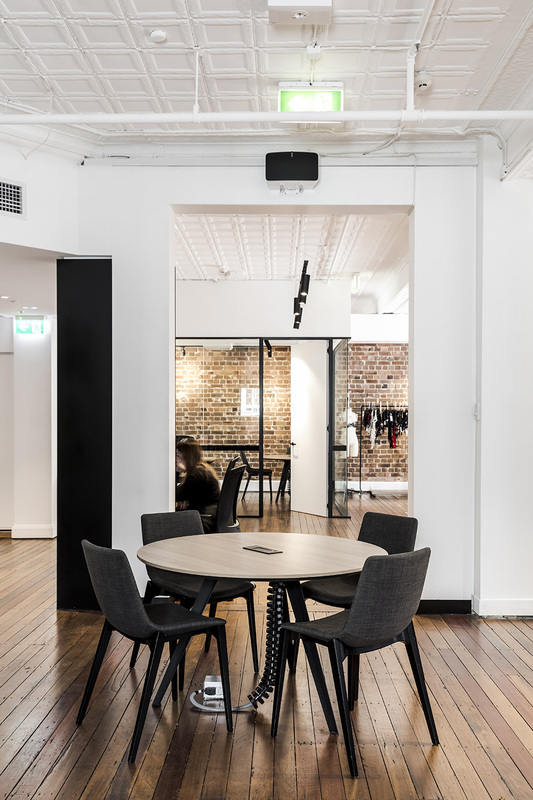 From its practical working areas to its playful breakout spaces and informal meeting areas, not a detail has been overlooked in Coca Cola Amatil’s new Melbourne workspace. An eye catching palette creates a fresh modern aesthetic with hints of warm wood grains, greys and pops of colour. The selection makes for a sophisticated yet fun and inviting environment for the ever growing business. The main office features a brilliant selection of Keywork and Trak whilst Dart tables, high back lounges and Universal lockers were a standout in other areas. All in all, Coca Cola’s new Melbourne office comprises of all the luxuries a global leading brand expects. 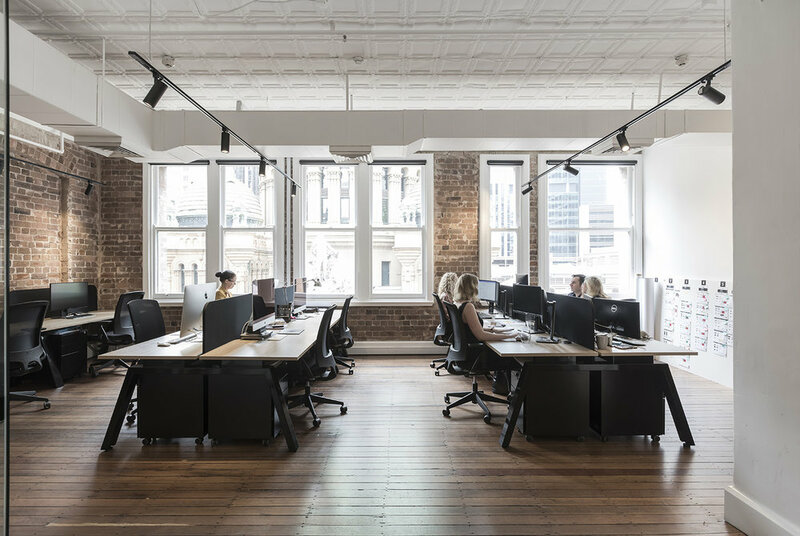 Embracing all the luxuries of a modern day workspace MOQ Digital’s new Sydney headquarters embodies contemporary class with the utmost functionality. Showcasing our furniture in a brilliant blend of crisp whites, beautiful wood grains and striking blues, the designers at Jensen projects have created a space that truly captures the essence of our brand. 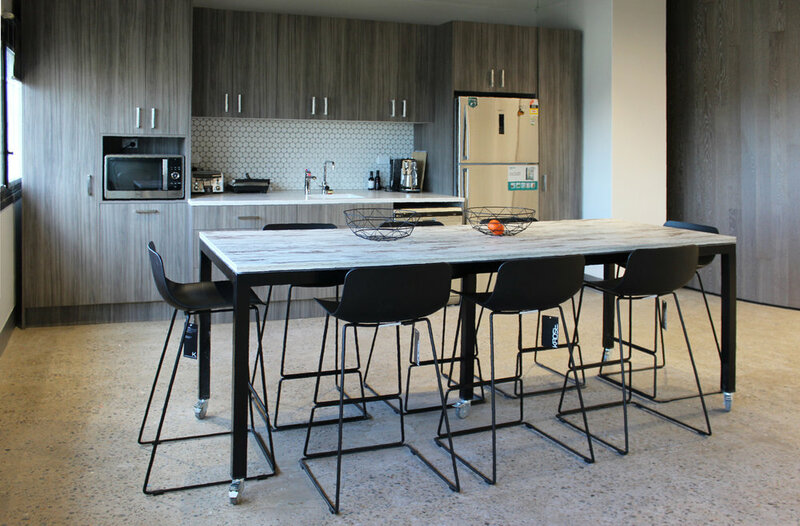 Multiple runs of Benchwork workstations stand out in the main office whilst Dart and Jam tables compliment the meeting and boardroom perfectly. A clever selection of chairs also feature throughout, with Miro being paired with the workstations, Zed and Space with the meeting tables and Zorro chairs and stools in the breakout spaces. Mix blocks and cushions upholstered in a sophisticated textured fabric enhance the café area, whilst Cali chairs and Dart coffee tables shine in the reception, both settings creating a comfortable and visually pleasing outlook. All in all, MOQ Digitals new workspace can now be described as a timeless beauty. 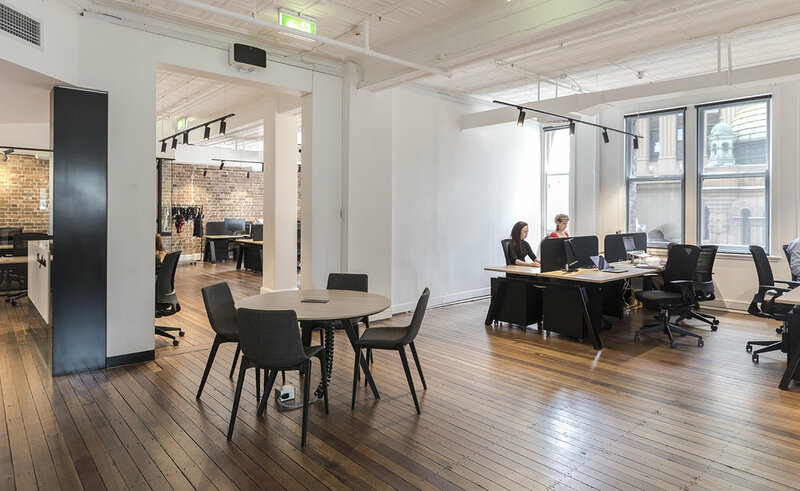 Setting the scene with their shipping container meeting rooms, Temando's new offices in Woolloomooloo epitomise sophistication, modernity, efficiency and fun. All features that bode well for a leader in commerce shipping platforms. 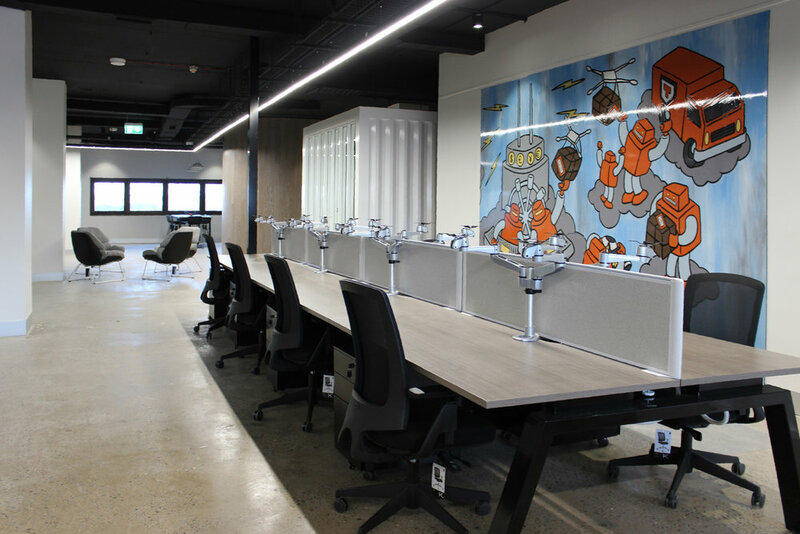 Each area of the fit-out includes a distinctive element; from the artwork in the open office space, to the shipping container meeting rooms and bold Space chairs in the boardroom, Envelope Architecture and Belvedere Projects perfectly captured Temando's vision. 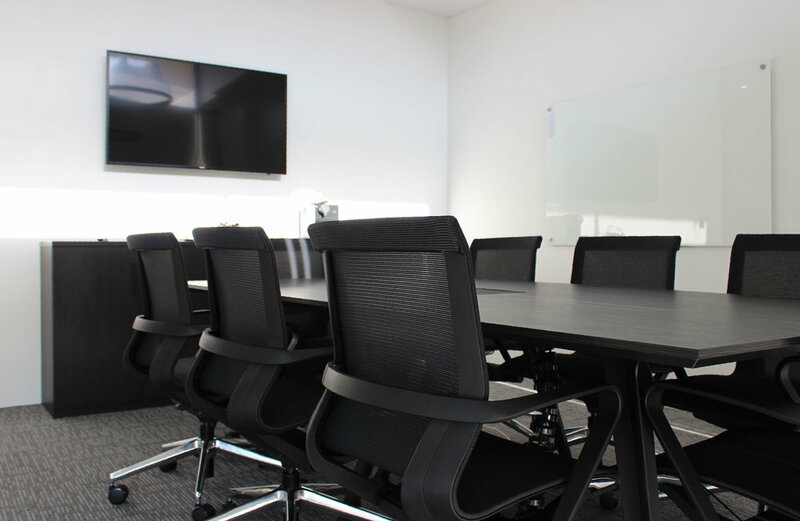 The meeting rooms feature our Oslo boardroom tables and a selection of our Space and Zed chairs, while the open plan office has been furnished with Keywork workstations, Screenwork screens, Miro chairs and Globe mobile pedestals. All the desktops were equipped with Logic dual monitor arms maximising individual desktop space and promoting ergonomics. Temando's new space also includes informal settings to gather around furnished with Jena chairs, Uno counter tables and Zorro stools. Brilliantly designed, this ultra- modern office features all the elements to succeed.